Akothee couldn’t believe people who are close to her could actually let her down. The mother of five was forced to reevaluate how she relates with people after her daughter’s charity event. Celly Rue Brown held a charity event in Nyalenda, Kisumu but the event was not a success. Her mother came out cursing after people close to her snubbed the charity event. Akothee says that guests were only required to come with sanitary towels which were to be donated to girls, but she was surprised that only one lady sent a sanitary towel while others she invited chose to give the charity event a wide berth. Akothee further reveals that she regrets having sent many people messages to invite them to the charity event. She says she should have invited her fans instead. “😂😂🤣😂 people can’t even donate sanitary towels for 60 bob to a girl child 🙄🙄🙄🙄 and we be making hair for 10k and lashes for 8k and alcohol for 100k , and you busy reminding me if I ever do charity ! 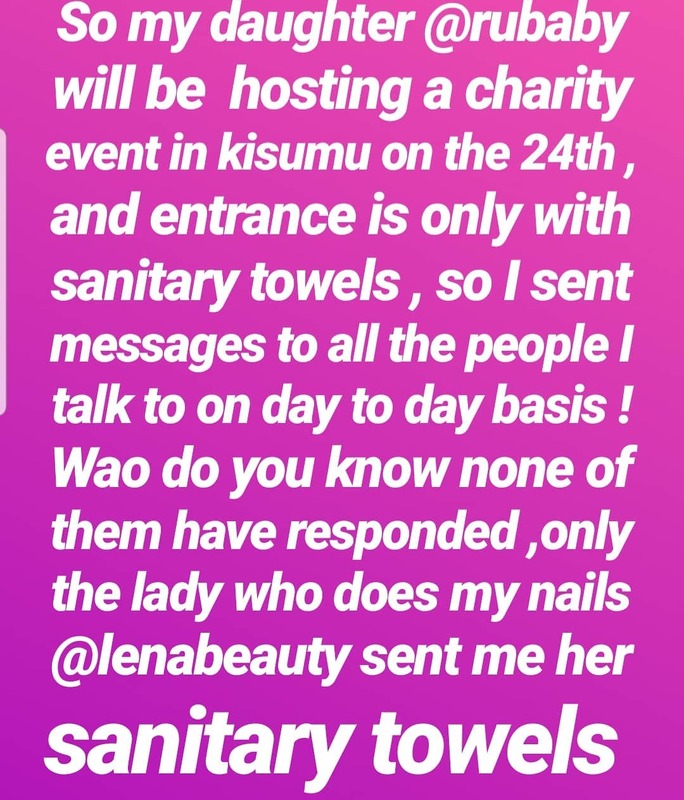 Wait and see my fans come at large, I actually regret having sent them the message , I would have just asked fans to come and help us support girl child with sanitary towels on the 24th in Nyalenda kisumu ! This nigas ain’t loyal 🙄🙄🙄🤣😂🤣😂🤣😂 zi have fans who are supporting charity events all the way from diaspora wait and see,” wrote Akothee.